She was on one of her bandwagon rants again, this time on the stuff left over after New Year. I hadn’t like to mention the strong fruity whiff emanating from the big table as the bananas became blackened. Dad says he likes black bananas so I thought he would have polished them off but it seems its not only me on a svelt-awareness kick. The wind is blowing gale-force strongly from the west, and as I have already mentioned, thats when our dragon becomes very active. the Aga top was so hot my tail toasted and I was forced to retire to the sofa. Dad pulled the flue flap out to reduce the air pull while Mum gathered ingredients for a cook-fest. Such a hot stove could not be allowed to go to waste. 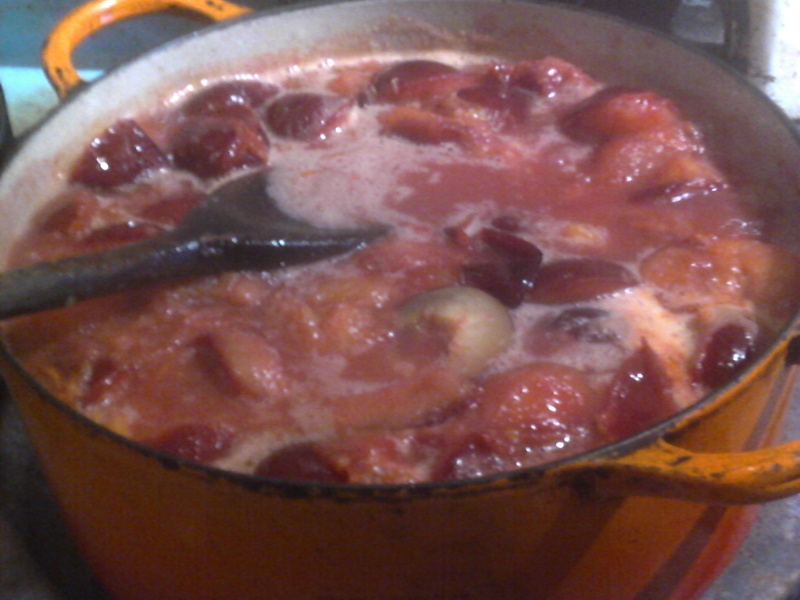 First up to be cooked was a plum conserve called Porwidl or plum butter. In a large pan, melt 2 oz butter. Add the stoned plums, rind and juice. Cook fruit till thick and dark coloured (no, not burnt), stirring frequently so it doesn’t stick. For total smoothness you can sieve the skins out. Mum hates fuss so didn’t. At this point find 10 small jam-jars, clean, dry and heat them in the bottom oven (if you have an Aga) or microwave if not- lids and indeed jars can be sterilised in a low oven. Add sugar, melt it in. Stir well. Pot the preserve into the hot jars, smoothing the top. Heat the remaining 1 oz butter and pour a little on the preserve surface to exclude air. You can add a waxed disc too for luck. Cover with the lids and tighten them. Label, with reminder you need to fridge this once opened and in any case to use within 6 months. When cool, keep in a cool dry preferably dark place. Serve with your rye bread or crumpets as from the earlier blogs. 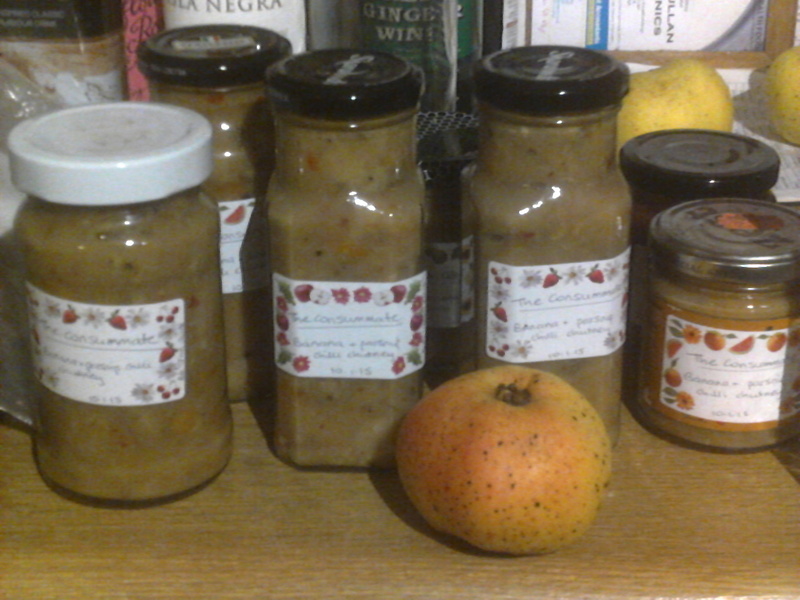 The Dragon’s hearth still being hot, Mum continued by making a chutney. She chopped up all sorts of veg and fruit and boiled it (funny idea she has of what she should eat i am sure). Here is her recipe. Her friend Pat came over while she made it and helped with the stirring and the tasting. She said she put lovely wishes and blessings in and that it tastes great. Its not tuna though, is it? Come on Mum, get that tin open. The how to: In a big pan put oil, garlic and onion and sweat till soft. Add ginger, crushed spices, then water and all fruit and veg except red sweet pepper (=capsicum) add sugar and vinegar, salt to taste. Cook till thick. Add the pepper for colour. Sterilise medium sized jars as above in Porwidl recipe. Pour/spoon chutney into hot jars and screw lids on tightly. 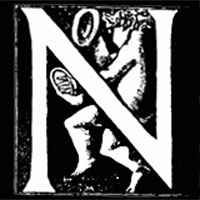 Label and store for 6 weeks before use. If you can resist it.